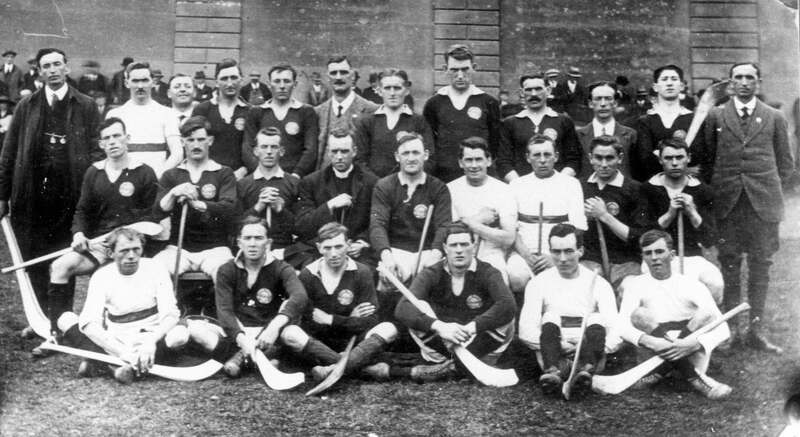 This is the Cork (Selection) team that won the 1919 GAA Hurling All-Ireland title. Cork beat Dublin (Collegians) on the score of 6-4 to 2-4 in the final, played at Croke Park on September 21, 1919. The team that played in the final consisted of: Back row: S. McCarthy, M. Byrne, N. Grey, J. Barry-Murphy, T. Irwin, Seán Óg Murphy, D. O’Gorman, C. Sheehan, J. Lynch, D. Ring, J.J. Walsh. Middle row: T, Nagle, P. O’Halloran, J. O’Keeffe, Rev. Fr Fitzgerald, J. “major” Jennedy (capt. ), “Spud” Murphy, J.B. Murphy, J. Hassett. Front row: F. Barry, C. Lucey, F. Kelleher, M. Murphy, P. Healy, E. Coughlan.